I've set up shop over at Etsy, so head on over there if you'd like a peek! Please forgive my boring item names and descriptions, I was feeling decidedly uncreative in the head this morning (and the babe nursing on my lap didn't help). 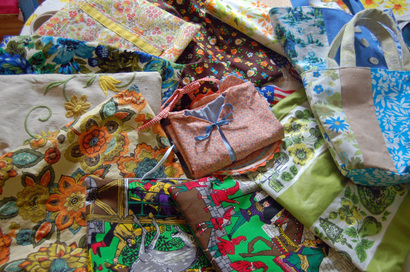 I listed a dozen bags and one baby kimono set. I hope to update again soon with some circle bags, but I don't know exactly when 'soon' will be yet, so stay tuned in the coming weeks.